An Adventure in Mysticism is an intriguing and thought-provoking book. It will expand your knowledge and open your mind to new possibilities. The book is actually in two parts. The first part of the book prequels “Armageddon and the 4th Timeline.” The second is a more scholarly approach, delving into interpreting scripture. Author Don Mardak has a gift for approaching spirituality with an engaging and interesting fictional backdrop. Mardak takes us on a thrilling ride through spiritual learning and growth as we follow Eric on his path. Eric is a wonderful character that is easy to identify with. He is like a child eager to learn in a passionate quest for knowledge. As Eric explores his beliefs we are right along with him finding ourselves questioning our own beliefs and where they come from. Mardak’s writing is delightful. It is clear and well researched. It is also full of humor and lightheartedness. The story flows beautifully and naturally opening our minds to new ways of thinking about things we have been looking at all our lives. The amazing thing is all this is achieved in a pleasant and entertaining manner. The second part of the book is an excellent read. It explores the meaning and interpretation of several biblical passages. It is both enlightening and a great reference. I highly recommend it! Spiritual journeys. They aren’t just about self-discovery, but trying to find the greater truths woven through the fabric of our life. It requires using all of our senses and faculties to explore and uncover these truths; truth does not merely belong in the realm of rationality. We must always search deeper, to the roots of our soul. An Adventure in Mysticism is a spiritual journey—not just for its main character—but also for the reader. Insightful and inspirational, the book plunges us into a worldview that defies our senses, that speaks straight to our soul, reverberating. This is literature as a beating heart, full of life, full of potential. Mardak crafts an enthralling tale, rich and vibrant. There were moments that I found immensely profound, where I found myself stopping to digest my thoughts and feelings. The characters are remarkably easy to relate to; their journey feels intimately personal. And that is the best part of An Adventure in Mysticism: it offers each reader their own personal journey, and a spiritual opportunity of a lifetime. Highly inspirational, it will greatly strengthen your faith. As I sit down to write this, I am in a blissful place where words have fallen away. This book is obviously written from the place we seek in meditation. There are many books talking about spirituality from an outside perspective, simply regurgitating what others have said or written. This is not one of those books. Don Mardak writes like a Master and guides you into the stillness of truth; the very essence of this story. Like any great Teacher, he directs the reader back to his/her own heart, which makes this more of a spiritual experience. This book is alive. It reaches out as if it was written specifically for each individual. It dazzles the mind with great storytelling, humor, and wit, while leading to a deeper state of awareness. This is a must read if you are seeking truth and desiring more. As the prequel to Don Mardak’s multi-award-winning novel, “Armageddon and the 4th Timeline,” this book is the story of one young man’s spiritual awakening and his introduction to a lifetime search for Truth. We learn how the main protagonist, Eric, meets his enlightened Master Shimahn, and as a result of that moving encounter, proceeds on an amazing adventure of Self-discovery. But this is really two-books-in-one. While the first part narrates Eric’s charming story, the second part, titled “The GOSPEL According to I AM,” provides mystical interpretations of select Bible passages that, if they don’t enlighten you, will certainly cause you to rethink your long-standing perceptions and concepts about life as you have always known it. The writing is so well crafted that it draws you into the story to the point that you feel you are right there with all the characters. A highly recommended read that is also suitable for teenagers and anyone else who has questioned the old theology and has been searching for answers to the true meaning of life. Right from the start, I found myself swept up in this introspective and suspenseful tale, eagerly flipping from page to page until the very end. “An Adventure in Mysticism” is the kind of novel that blends together drama and emotion with thought-provoking insights, making for a truly stunning novel that doesn’t disappoint. Don Mardak does a wonderful job of drawing the reader into the story with vivid imagery, strong dialogue and authentic characters that allow you to create strong connections with them throughout the novel. The author has a talent for writing and world-building that adds layer after layer to this story, creating a complex novel filled with intrigue, emotion, thoughtful writing and insightful truths. From fast-paced entertainment to thought-provoking spiritual insights, this is a novel that captivated me from the very first page. Overall, it was well worth the read and it has me eager to read more in the series. I normally start my reviews with a summary of the book, but this time I’m just gonna dive right in for two reasons: this is technically two books in one, so it would be hard to do without confusing you, and also because this book is one that defies summaries and words in general. An Adventure in Mysticism is hard to put down. Don Mardak has taken a subject that can be difficult to read and understand at times and broken it down and made it not only easy to read but enjoyable as well. It is suspenseful, humorous, spiritual, intellectual, and so much more all rolled into one. It leads you down the path of enlightenment, but it doesn’t drag you down it kicking and screaming; you want to take this journey. The GOSPEL according to I AM is more on the academic side, but no less entertaining. It is full of Bible verses and interpretations of scripture to get your brain open to looking at the world through a different lens. It gives you the tools and questions to ask yourself and others to make you think and get you to open your mind. Both of these books are amazing reads. Alone they are great, but when you read them together it makes reading them a different experience. 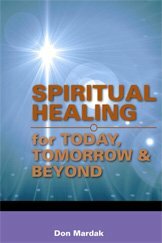 If you are into spiritual books this is a must read for you. Even if that isn’t your cup of tea, this is still a book that should be on your to-read list. Don Mardak has really created something special that everyone needs to be a part of. I must tell future readers that “An Adventure in Mysticism,” does not fall short of its praises at all! I have yet to read something from another writer that has been able to write and combine a work of literature as compelling and invigorating as Don Mardak!!! Writing is truly a God-send talent for this unique author, and it clearly shows throughout his work. It is truly a remarkable book! Consisting of an awe-inspiring story, and an exceptional Part II that will literally WOW you! Even after I was finished with part I, and thought about taking a break, I couldn’t put it down. I was so captivated by this book because it was relatable, made me really think, and yet was still highly entertaining. I read the sequel “Armageddon and the 4th Timeline” first, so I had already been introduced to some of these wonderful characters. However, it was still a joy reading the beginning of their story; which was so well written it seemed to come to life as I read! Within the story, Eric is just a boy when he begins his spiritual journey and meets characters that will be some of the most influential characters in his life to come. As the story progresses, Eric gets older and continues traveling/searching for the truth. The road to his spiritual awakening is light-hearted and humorous, but jammed packed with relatable passages, and thought-provoking dialogue. I was truly able to relate, and thoroughly enjoyed every word of this amazing book! “An Adventure in Mysticism” is the kind of novel that manages to not only entertain you, but nourish your mind and spirit as well. It’s a well-written book that explores spiritual growth, spiritual awakening, coming of age, love, self-discovery and the path that we all must take. Don Mardak does a wonderful job of keeping the story fast-paced, intriguing, engaging, vividly compelling and filled with character growth in characters that are authentic and real. What I like about this book is that it’s not just a novel, but it is a full interactive experience … using the second half of the book to delve into the mysteries of “The GOSPEL According to I AM” and providing biblical passages and their mystical meaning. This is a book about soul searching, about life, about Eric’s journey to spiritual growth and growing up … exploring the man he is and the life he led before the next book in the series “Armageddon and the 4th Timeline” began. From humorous to emotionally charged, this is a novel that engages the reader from start to finish. “An Adventure in Mysticism,” by Don Mardak, is a fictional tale with deep spiritual principles. It is the first book in Mardak’s Grand Circle series. The book is broken in to two parts. The first part follows the main character Eric as he moves along his spiritual journey in search of “Truth.” This part of the book is part fantasy, part suspense, with lots of spirituality and humor thrown in. The second part of the book is “The GOSPEL According to I AM.” This portion of the book has more of an academic feel to it with lots of Biblical references. While reading this book, I felt like I was getting a very dynamic experience. I was entertained, I was laughing, and I was thinking/reflecting. Another great book by Mardak! “An Adventure in Mysticism” is the prequel to “Armageddon and the 4th Timeline,” which I loved as well. I really enjoy books that have a deeper meaning making you contemplate the big questions in life. “An Adventure in Mysticism” is not as fast-paced as “Armageddon and the 4th Timeline,” and while I enjoyed the excitement in “Armageddon” I really appreciate the slower pace and the back-story of the characters in this story. Both books complement each other very well. Don Mardak has written a series that is entertaining and enjoyable, that has spiritual truths intertwined throughout. The second half is “The GOSPEL According to I AM.” I enjoy the author’s outlook on life and am inspired by his interpretations of scripture. Simple truths that sometimes get misconstrued or forgotten about in our busy lives. “An Adventure in Mysticism” is the type of book that you’ll read quickly, but won’t easily forget. Another book by DON Mardak I would highly recommend. “An Adventure in Mysticism” is the prequel to “Armageddon and the 4th Timeline,” a book that saw the end of the world drawing near and Eric traveling back to various points in time to save it, under the guidance of his spiritual advisor, Master Shimahn. The first part of this story is Eric’s coming of age and his spiritual journey, starting with his journey to the Holy Land with his parents at age 12. That’s where he first meets Master Shimahn and begins to progress in his spiritual development, with the help of other teachers and a book called “The Gospel According to I AM.” The second half of the book is the gospel itself, a collection of Bible verses and discussions that illuminate the true nature of God, eternity, and planes of being. While “Armageddon” was more of a traditional action-adventure story, “Mysticism” is more character driven—the suspense comes from Eric’s exploration of spirituality and how he will continue to develop; I especially enjoyed the fleshing out of his relationship with Kathy, and how he meets her as a child and then again as a young man. At the start of the story, Eric has all the freshness and excitement of a child who has made a great discovery, and the author does a great job of putting this feeling and potential into words, making you as a reader excited as well; Eric refreshingly doesn’t lose this sense of wonder as he marches toward adulthood. This book can stand alone if you haven’t read “Armageddon,” and I would recommend it to readers who enjoy books on mysticism and spirituality with a fantasy twist (it felt a bit like Richard Bach’s “Illusions” in a good way). This is a beautiful book, touching on the spiritual enlightenment we all have within us. I was so moved by this book and felt such a peace of my own. It is a sweet story of Eric and love, and finding the path God has chosen for him. The world we live in is so busy and hectic, and we all stress far too much. I have always believed each of us has a purpose and reason for being who we are and this book opened my eyes to want to find my spiritual calling. When your soul and spirit are cleansed your world becomes a better place. This book is written so beautifully and it grabs you and holds on. I have truly been moved and shown the light. Don Mardak has been blessed with the gift of sharing his words with the world and his warm and gentle heart shines like light from heaven. I highly recommend this book to everyone, each of us needs to find our path to Truth and this book is a way to start your journey. “An Adventure in Mysticism – featuring The GOSPEL According to I AM” – 5.0 out of 5 stars. Contrary to world opinion, it looks like lightning can strike twice. Don Mardak does it again with “An Adventure in Mysticism,” the prequel to his award-winning book, “Armageddon and the 4th Timeline.” While not as intense as “Armageddon,” the prequel has just as much entertainment value, and even more depth in the teaching of mystical principles. This is really two-books-in-one, with the first part being a charming story of how Eric met his Tibetan Master, Shimahn, and his wife Kathy. It also describes how Eric, after being separated from his parents in Jerusalem when he was twelve year old, proceeds on his spiritual journey of discovery, awakening and enlightenment. Part 2 of the book, “The GOSPEL According to I AM,” provides dozens of Biblical passages, along with their mystical interpretation, demonstrating that there is much more to life than can be perceived with our physical senses. A truly remarkable read that is highly recommended for anyone who likes to be entertained while also being enlightened. Spirituality and entertainment collide in an astounding fashion. Having read “Armageddon and the 4th Timeline,” and loved it, I was excited to see that a prequel was out for all of us to enjoy. “An Adventure in Mysticism – featuring The GOSPEL According to I AM,” like “Armageddon,” teaches those same principles, but with a more in-depth view that allows the reader to connect with themselves in a profound manner that is not for the faint of heart. It truly is a book that will have you soul searching well into the late mid-night hours. It did for me last night as I finished it around 2am. In short, “An Adventure in Mysticism” is two books in one: The first part is fiction as opposed to the second part that is more geared towards non-fiction. For the fiction part you will embark on a journey with main characters Eric and his wife Kathy. You will see and learn how they met as well as how the Tibetan mystic Shimahn got into the mix of the story. All of the characters are developed lovely and in an amazing fashion. Their personalities are multi-dimensional as well as easy to relate to. The landscapes and scenery are vividly portrayed with lavish descriptiveness. It’s as if you are walking next to the characters as they embark on their journey. I have to admit that I was not surprised to find the prequel to “Armageddon” to be just as wonderful. Author Don Mardak is simply brilliant and a Master Storyteller. I won’t divulge into the details but the second half of the book touches upon “The GOSPEL According to I AM” and is literally filled with dozens of Bible passages, that flow in conjunction to their mystical interpretation. Amazing! In closing, this is a well-written book that flows perfectly. It is original and unique and definitely sets the stage for “Armageddon and the 4th Timeline.” It will sweep you away and leave you wanting more. 5 Stars for Author Don Mardak, and a must read for all. This review is for: An Adventure in Mysticism: Featuring the Gospel According to I Am. I have to start this review a bit different than I usually do. An Adventure in Mysticism: Featuring the GOSPEL according to “I AM” is a FANTASTIC, original story. Well written and so intriguing I could not put it down, and stayed up way past my bedtime. This was one of the best books I have read all year. I like the freshness of his character and the differences he presents. The main character’s dilemma will make you think of your own as well. Then I wanted more. It is beautifully written and deep enough to provide much food for thought. The author not only tells a story – stories whose outcome will come to truly matter to the reader – he also adds spare and lovely descriptions and backgrounds that make the work into a complete package. I think Don Mardak is a very talented writer, certainly better than most self-published writers out there. My hope is that the future holds more of Mardak’s travels. This book comes highly recommended, and Thank you Mr. Mardak! “An Adventure in Mysticism” is a two-part book that tells the story of one man’s spiritual awakening based on his discovery of a biblical text, “The Gospel of I AM” in the first half and then provides the actual text of The Book of I Am in the second half. It is the prequel to Don Mardak’s “Armageddon and the Fourth Timeline,” a novel that combined science fiction and mysticism and told the story of both a spiritual awakening and an adventure involving an imminent world apocalypse and one man’s journey back in time to save humanity. “An Adventure in Mysticism” delves more deeply into the early spiritual development of the hero, Eric, starting with his travels to the holy land at a young age, meeting the man who would become his spiritual adviser, and his discovery of The Gospel of I AM, which reveals new biblical truth about states of being and the very nature of God. Both books combine elements of adventure/fantasy and elements of mysticism, but much of the action in “An Adventure in Mysticism” is provided by the description of Eric’s development of a divine awareness. The cliffhangers here are based more on following his discovery of new truths than on his ability to save the world from perishing. The book is a charming blend of spirituality and entertainment. It is a thought-provoking exploration of religion, the nature of divinity, and of personal awakening as it relates to conceptions of God and what it means to be human. This is the prequel to “Armadeddon and the Fourth Timeline,” a novel that combined science fiction and mysticism and told the story of both a spiritual awakening and an adventure involving saving the world from apocalypse. “An Adventure in Mysticism” delves more deeply into the spiritual awakening aspect, telling the story of Eric, the main character, and his evolution in terms of transcendent awareness. On a journey to the Middle East with his parents, he first meets Master Shimahn, who will become his spiritual adviser and figure prominently in “Armageddon.” It also tells the story of Eric’s exposure to the Book of I Am, which reveals new biblical truths about states of being and the nature of God. Both books combine elements of adventure/fantasy and elements of mysticism, but this one is much more heavily focused on the spiritual awakening and development of awareness in Eric that make the action in “Armageddon” possible. It also tells the story of how Eric met his wife Kathy, and the story of her spiritual evolution is interwoven with his. The adventure and action in this prequel, rather than coming from more traditional scenarios, are provided in the descriptions of Eric’s development of awareness and realization of new truths. In some ways, this book reminds me a bit of “Dune,” another novel that combines science fiction and religious/mystical ideas. And this one is, I think, just as good as that classic of science fiction. I was beyond glad I bought it, especially when I read the story of Eric and his meeting Nehemiah. Something about this book and the stories the author told really resonated well with me. The meeting I just described was something I thought about even after finishing this book. I think many people, myself included, look for answers but the answers you find have to be right for you. In other words, one size doesn’t fit all. The author takes us through a similar situation in this story. The story is very well written and I enjoyed reading it from start to finish. Beautiful book regarding spirituality and one man’s personal quest. Not a fan of spiritual books. This book was more than spirituality, it was a discovery of one’s belief. The characters were written so well, I felt when they interacted I was sitting in the same room as them. I opened this book and never closed it until I finished. I highly recommend this book to anyone who is looking for a good read. 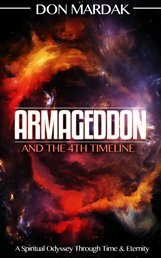 I recently read another one of Don Mardak’s titles, Armageddon and the 4th Timeline. As always, I feel incredibly enlightened by the many ideals this clever author exposes his readers to. A combination of fantasy, biblical teachings, and spirituality, you’ll embark on a journey that exposes you to profound truths and even more intriguing questions. An intelligent read and one that must be cherished. I highly recommend it! What more can be said? What more can I say? Driven by the sequel novel “Armageddon and the 4th timeline”, I was very curious about this book. It turns out that this is a prequel to one of the best books there is. It explains in detail why Eric became Eric, Kathy became Kathy, and how all things in the other book came to be. This book is divided into two parts. The first was the story part where the plot before the main book was established providing the how’s and who’s of “Armageddon.” It was pleasant to read and has answered some holes left on the other book, which in fact cannot be thought if you have not read this book. The second part is the Gospel According to I AM—a very refreshing and spiritual book. As a Christian myself, this part somewhat reminds me of a kind of summary of almost all the preachings I heard through my pastors. It was so well researched and well written that you will not miss a beat understanding what this is for. This part shows 100% who or what the author, Don Mardak really is. If you haven’t been enlightened and are more curious of what this review brought you, I highly suggest you pick up these two books by the author. Highly recommended—entertainment-wise and spiritual-wise. I enjoyed this book just as much as his other book, for their fun characters, spiritual cleansing, and amazing plot lines! I read Armageddon and the 4th Timeline prior to this and was compelled by its idea that religion, science and politics are all interacting in the real world to create a potentially apocalyptic situation. An Adventure in Mysticism forms the foundation for that, but more for the foundational principles of spirituality and tells an enthralling fiction tale along with this. I found this book akin to a modern-day version of the Everyman play, intelligible to modern audiences but with the same themes, as it leads Eric through a spiritual journey. An Adventure in Mysticism is a winding mental path through the spirit leading to the divine, and it makes some convincing arguments for what lies beyond while teaching lessons we’d all do well to ponder. It is so very rarely that a book surprises me in any way. An Adventure in Mysticism was one of those rarities. This book had a very original plot with fantastic characters. The captivating aspect of this book was that it transcended the normal immersive qualities of a book and elevated it to not only an engaging and immersive storyline, but a thought provoking and meta-cognitive process as well. I could not put this book down from the moment I picked it up. I read it straight through and loved every minute of the captivating storyline and loveable characters. I also love that it was actually two books in one. It was like getting a bonus book. The author is very talented in making stories come to life, and I can’t wait to see what he comes up with next! This is my second foray into Don Mardak’s creations, a journey that has proven just as entertaining and thought provoking as his previous work. A prequel to “Armageddon and the Fourth Timeline,” “An Adventure in Mysticism: Featuring The Gospel According to ‘I AM,’” sets the ground work and creates a world for which questions and answers grapple with the truth and may even upset things you’ve taken for granted your whole life. We saw Eric in the Fourth Timeline, trying to save mankind and all of creation. This story, however, focuses on how he got to that point. What shaped this remarkable man? When did he meet his spiritual teacher? While fictional in nature, this book hits hard and will make you ponder many things. When you get to the second part, The Gospel According to ‘I AM’ – the Gospel Eric read, those questions will only get deeper and more meaningful for you; yet along with those questions, a few answers can be found as well. This is an incredibly enlightening book. The first part is a fantasy, which is great to read and will get you thinking. The second part “The GOSPEL according to I AM,” shows that although you may not see anything at face value; there is more to life than what you understand. I really enjoyed this adventure into mysticism and I feel I have definitely come away with something after reading this. It doesn’t matter whether you are a believer in religion or not; there is something in here for all. This is such a thoughtful book. It’s really two books in one, as the first part is a story of Eric and his spiritual journey and the second part is an exploration of many scriptures. I really liked the descriptions and interpretations in the second half of the book and I felt like I’d taken a course in spirituality when I finished. Overall, this is an entertaining book that kept me reading. It had some funny moments and the author’s passion shines through on every page. If you read the book, “Armageddon and the 4th Timeline,” then you’ll find this prequel, “An Adventure in Mysticism” contains many of the same principles, but explained even more in-depth. This prequel has the proper blend of spirituality, metaphysics, and high entertainment. I enjoyed the suspenseful fictional novel found in the first half of the book, which goes into detail about how Eric meets his wife, Kathy. I also enjoyed the second half of the book, which offers many Bible passages and their interpretation. The author is great about providing metaphysical information and explaining their meanings. I’m a spiritual person so “An Adventure in Mysticism” is just up my alley. I’m a fan of Don Mardak’s work, and I can’t wait to read more. This is a very beautiful, touching, introspective and inspirational book. I can compare the contents of this book to this author’s previous book, “Armageddon and the 4th Timeline”, and say that “An Adventure in Mysticism” goes deeper in its spirituality. It may be less intense but it is a perfect blend of spirituality and entertainment. It is as if this book is two books in one with the first part leaning more to the fictional side where it tells a story of how Eric met his wife Kathy as a child and then as a young man and the last part giving us a number of Bible passages with their mystical interpretation. Unlike “Armageddon” being more action-driven, this book is more character driven. This book will get readers excited. I personally am a spiritual person and the approach that the author took with this book is overwhelmingly captivating! It kept me reading for hours, as it really allowed me to look within myself. This book was amazing. Two Thumbs Up! I might not have started in the right order with Mardak’s books – but I know for a fact by now that each time when I open one of his books, I’ll find inside the right mix of mysticism and adventure—a complex story that will not let down his readers. “An Adventure in Mysticism” offers the right balance between fiction and biblical writings. The first part of the book reveals Eric’s story, a young man who travels to Jerusalem, where he goes through a spiritual awakening, through conversations with Master Shimahn from Tibet and Nehemiah, back to Chicago where he shares the story of how he met his wife. The second part of the book gives a great mystical insight on Bible passages – and the two parts mix together in a very interesting and complete read. I was immediately taken by this book. It seemed to offer an in-depth and fascinating look at the journey we take in life, and I was proven right when I began to read. Instantly, I was engrossed in a story that brilliantly combined drama and raw emotion. It’s very rare for a book to be able to make you question and reflect on your own path in life but this is a special exception. We follow Eric as he enters true adulthood and carves out his route in life. Along the way he learns a lot about the world and himself. In the second part of the book we are treated to some biblical passages, which I found to be insightful and somewhat comforting. Both sections of the book are thought provoking; they leave you to interpret the text to find your own meanings and messages.3Overall, I have to say that rarely has a book had such an effect on me. Plaudits have to go to the author for crafting such a brilliant piece of literature. Highly recommended for all! Very well written, and enjoyable to read. I highly recommend this! This book managed to be introspective and suspenseful, enough so that I found it hard to put it down. The first part of this story is Eric’s spiritual journey; the second half of the book is the “Gospel”, a collection of Bible verses and discussions that reveal and reflect on the true nature of God. This book is actually the prequel to another book, Armageddon and the 4th Timeline, which I haven’t read yet (but I will), but this book can stand alone, and I had no trouble following the plot. This book had a bit of a “coming of age story” feel to it, though Eric doesn’t lose his sense of awe, as he becomes an adult. Mardak is an excellent writer as well and he does an excellent job of infusing emotion into his writing that makes you, the reader, feel excited, and really brings the story and everything in it to life in your mind. I was a fan of Armageddon and the 4th Timeline so naturally I was eager to pick up this prequal. A few friends of mine who had also read Armageddon had a unique perspective on this book. Compared to the first book, it’s a lot different. Armageddon and the 4th Timeline was strewn with a lot of action, which made it a fast-paced need-to-see-what-happens-next read. This book was an entirely different experience, and although it did keep me eagerly turning the pages, it did so for an entirely different reason. This book took more of a spiritual route to its intrigue. Rather than having an action-packed storyline, this one was a lot more slow-paced. It allowed the characters to develop and you get to watch Eric, the main character, grow into an adult. And I think that’s what makes this story so intriguing—especially for people who have read Armageddon and the 4th Timeline. We already know Eric, but now we get to delve deeper into who he is and what made him the man he was in the other book. Now, don’t get me wrong, this book is equally as entertaining and thrilling to read as the sequel — but this one delves deeper into the characters and allows you to truly connect to “Armageddon” on an even deeper level. One aspect I really enjoyed about this book is that we got to see how Eric met his wife Kathy. And as a girl, obviously any romantic aspect of a story makes me swoon—so I thoroughly enjoyed this addition to the story. As with “Armageddon” this book was filled with a lot of modern spiritual exploration. And the second half of the book, even more so, delves into Christianity and the mystiques that come within the Bible. The first half of the book features more of a fiction story, while the second half of the book takes you into a non-fiction-esque piece about the Bible. And although I’m not Christian, I enjoy learning about other religions and hearing other people’s spiritual beliefs, so I found this really entertaining and I felt it certainly accentuated the entire “Armageddon” experience as a whole. Overall, this book was certainly different from Armageddon and the 4th Timeline, but it was well worth the read for people looking to delve deeper into the story. I enjoyed the uniqueness of it, and the spiritual undertone. It was well written. The character development was beautifully done. Overall, I’m extremely happy I took the time to read it. I’ve read more than my fair share of “self-help” literature, so I can assert with conviction that this is not a self-help book. Instead, it’s a revelation book. Each chapter triggered numerous “ah-Ha!” moments for me, because Don Mardak goes a step (or two, or five) beyond the common way of looking at or framing an issue to reveal the interconnectedness of elements that stall or sabotage our efforts to live a more satisfying life. The results that Mardak presents in this readable book are nothing short of fascinating, and they function not as a how-to manual for quickly fixing an out-of-balance life, but as a set of powerful tools with which to cultivate a richer, more fully engaged and connected life. A wonderful story for people of all ages. Don has an amazing gift for taking deep metaphysical information and putting it into the easily digestible form of children awakening to the great gifts the world has to offer and the power of what they “believe”. I enjoyed every moment of the book. It was a very fast read, and I love it that I could share it with my 15-year-old great niece and we could have a conversation about it. It’s appropriate for any age range. Don Mardak has written a spiritual and entertaining book that is a prequel to “Armageddon and the 4th Timeline.” In the first part, he starts at the time when Eric was 12-years-old and met Nehemiah and Shimahn on a trip to Jerusalem. It continues to his relationship with Kathy and the ministering engagement at Eliza Fowler Hall. The second half of “An Adventure in Mysticism” is “The GOSPEL According to I AM” with dozens of biblical passages and mystical interpretations. This is the perfect book for anyone interested in spiritual truth. It is well written and presented in a compelling way that will have you eagerly reading from start to finish. Like “Armageddon,” “An Adventure in Mysticism” teaches those same principles, but even in more depth. And it also tells the story of how Eric met his wife Kathy and his Tibetan mystic Shimahn. The story line in this book is less intense than the end-of-the-world nature of “Armageddon.” I feel it is a charming blend of spirituality and entertainment. The “Adventure” is actually two books in one. The first part being a fictional novel, and the second half—”The GOSPEL According to I AM”— being more in textbook form, as it offers dozens of Bible passages, along with their mystical interpretation. This story explores the principles of mysticism, which has a way of igniting the faith of believers in a special way. The plot has kept all my senses alert and I was hooked right from the start. I liked the part of how Eric met his wife Kathy and the entertainment value of this book is very high. If you are looking for a book that will inspire your faith, and keep you glued to the book until the end then check this one out. Highly recommended. I became a Don Mardak fan after reading “Armageddon and the 4th Timeline.” Naturally, when I came across “An Adventure in Mysticism”, which is the prequel to Mardak’s other book, I was excited to read it. The author has done a sublime job of blending spirituality with entertainment in this book. Consequently, the book is both captivating and provocative. I thought that this was a very interesting read. It chronicles the story of one young man’s journey as he explores the more mystical side of life. As we watch Eric progress through the story we get to watch as he begins to see and understand the more spiritual aspect of life and that not everything is always as it seems on the surface. I found it fascinating to read about this character and the progression of his beliefs as he is challenged throughout the story. The second part of the book was interesting because we actually get to read what the main character Eric used as he progressed through the story. It uses lots of examples from scripture to back up its arguments, which lends credibility to this part of the book. Overall, a very interesting read that I will be thinking about long after I am done reading. At some point in our lives, we all struggle with discovering our own beliefs. Do we blindly accept what has been inherited from our family, or do we forge our own spiritual identity? “An Adventure in Mysticism” takes on these questions and so many more in an easy-to-follow, character-driven narrative. You can enjoy this book simply for its surface story, but the author invites you to go deeper and think about your own life and spiritual growth. Definitely thought provoking, but still an enjoyable read. After reading Armageddon and the 4th Timeline, I grabbed this one as soon as I could! Needless to say, I wasn’t disappointed. Once again, Don Mardak has created a wonderful read in An Adventure in Mysticism. Between the loveable characters, vivid descriptions, and strong dialogue, it was easy to enjoy this thought-provoking novel. I especially appreciated Mardak’s ability to interweave the spiritual with elements of suspense throughout the plot. It’s incredibly refreshing to read works from an author who knows how to organize a plot and write solid characters. I definitely look forward to reading more! Note: this is a prologue in a series, but I think could be read as a stand-alone. The book “An Adventure in Mysticism” is a captivating fantasy tale full of spirituality, adventure, and captures your mind. From the beginning, I was taken in on this journey that Eric takes; he is in search of the truth. I enjoyed seeing how Eric grew in this book. The characters were great and well written. This book is the prequel to ‘Armageddon and the Fourth Timeline,” but this book I believe to be more of a spiritual journey with some adventure. The second part of this story uses scripture and the meanings behind them. It is more of a gospel read. Don Mardek is a fascinating writer, and I highly enjoy his stories. This is a powerful novel with so much meaning, and really makes you think. I feel this is a story I can share with my teenagers, and something I can come back to and have a different read or approach on the story each time. Life has so much meaning, and this book really helps you relate to that. Highly Recommended! I think I will use this for my next book club, would be a great book to discuss together with other people. I hope there will be more in this series; I look forward to it. I had already read Don Mardak’s book “Armageddon and the Fourth Timeline” and loved it. I then learned that this was a prequel to that book and that I could get some more background on the characters here as well as more in-depth knowledge of the mysticism principles that are carried through his books. What a great read! This is really a book that is broken up into two parts. The first part chronicles the main character’s, Eric’s, development as he grows up, meets his wife Kathy and develops his spiritual ideology. The second part of the book takes you through The Gospel According to “I AM” in a textbook-like format that is both engaging and enlightening. As someone who is always looking for more spiritual depth in life, yet prefers to be entertained as I read, I found this book to be a perfect combination of both, and something that I will be sure to re-read in the near future. This one caught my eye after I read Armageddon and the 4th Timeline by the same author; it is the first book or prequel to that book. It follows Eric as he starts his spiritual awakening on his trip to the holy land and meets Shimahn one of his future teachers and is introduced to a new way of thinking about the Bible. The joy of watching Eric grow and never relent on his inquisitive nature is wonderful; the book is well written and structured with a pace that makes you think and consider as much as Eric. The second part is more for your development as verses of the scripture with particular emphasis are used to explain and are explained by the author. This is my second book by the author Don Mardak. Again, I am not disappointed by this one. Right from the start, he manages to capture my attention by providing good details and depth of the plot and characters. While this book continues with the theme of spirituality as in his other book “Armageddon,” it also provides enjoyable reading entertainment. The good thing about this book is that it is 2 books in 1. You get a fictional story for the first part, and it continues into the “The GOSPEL According to I AM” where some Bible passages with their mystical interpretation are offered. I strongly recommend this book to anyone who enjoys books about spirituality. You will not be disappointed! This is a wonderful book! I can so relate to some of the experiences and now I have explanations for them! This book flows and is difficult to put down. I feel inspired and validated after reading these words of The Gospel according to I AM. And I might add that the synchronicity while reading this book was the icing on the cake! Read it, and experience the adventure for yourself! I highly recommend Don Mardak’s books and his blog site. If you are pondering Christian mysticism this is a must read. I would also encourage you to read his other two books! After reading Armageddon and the 4th Timeline, I decided to read through its prequel An Adventure in Mysticism. Unlike, Armageddon, An Adventure in Mysticism takes a slower approach and focuses more on the spiritual growth and development of the characters rather than the action and chaos of “Armageddon.” But this approach to focus more on the character doesn’t take away from the novel one bit. Learning about the growth of the characters and watching them develop is a pleasure. The characters in this prequel are from Armageddon and the 4th Timeline with a few new faces, but this novel deepens our understanding of the characters that we meet in the first book. Anybody who’s read through Don’s other work will know that his writing style is unique and doesn’t match another author anywhere near. His writing style has great deepness and explores deeper beyond the skin of the characters into their essence. Don has mastered a very creative approach of writing style that is evident in all of his writings. An Adventure in Mysticism is great novel that fuses together some witty humor, spiritual growth, and mystic elements, creating a wonderful read that’s both an experience to behold and a daring journey. I would recommend this novel to anyone who has read through Armageddon and The 4th Timeline and wants to see more of the characters in that novel. 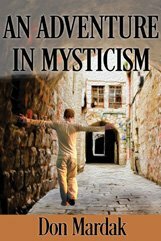 An Adventure in Mysticism is a fascinating book about one young man’s spiritual awakening. It is a well-told story that kept me interested in the main character’s journey. I like how the author wove in different religions and wrote in the story how they are all basically saying the same thing, something I’ve believed since I was a child. It reminded me of other spiritual books I’ve read and brought me a sense of peace while reading it. It wasn’t preachy or negative. It was enlightening and positive. There are two parts to this book. The first half is a fictional story with a spiritual aspect. The second half takes different passages from the Bible and has a summary or explanation about them much like a textbook. I recommend this book to anyone who is looking for a story that will make you think and learn a few things about passages from the Bible. I feel it is a charming blend of spirituality and entertainment. The “Adventure” is actually two books in one. The first part being a fictional novel, and the second half—”The GOSPEL According to I AM”—being more in textbook form, as it offers dozens of Bible passages, along with their mystical interpretation. The passages are all from the Bible so this is a great read for anyone, and one Christians will enjoy. An interesting adventure of a man who finds his spiritual path. The book offers a fascinating story of how to find one’s self. If you are interested in Christian mysticism, I highly recommend this book. It is well written and explains different points of view, and the arguments are well discussed.